planetf1.com • View topic - modesty panel or flat nose? how can you tell? modesty panel or flat nose? how can you tell? Post subject: modesty panel or flat nose? how can you tell? Title pretty much says it all, so many people seem to be able to tell that it is a modesty panel rather than a Mclaren 2012 like flat nose... but how can you tell? Post subject: Re: modesty panel or flat nose? how can you tell? You can tell by the height of the chassis itself. To have a high nose with a high chassis you would need to have a modesty panel as the height regulations do not allow for the nose to be as high as the 'tub', hence the step last year. These 2013 cars are essentially a similar design to last years, but the panel covers the step. the panels are very good! Force Indias were very noticeable on the launch on tv it didn't seem to sit flush with the nose but you cant tell in pics. You can tell because if it was not for modesty panel, the cars we have seen so far without stepped nose will be illegal. Their nose is actually higher than the regulations permit, but the structural part is lower. The upper bulge is just thin carbon fibre which will just crumble in case of crash. Had that part been structural, the car would have been illegal. That is how you can tell. Unless someone goes the way McLaren or Marussia and HRT went last year, they cannot design the nose without step while maintaining high front chassis design. The actual height of the structure might very little from team to team, but with current design trend, you can rest assure that those who dont have stepped nose have modesty panel. Well, that basically leaves only one question unanswered, how will Marussia conceive their car. Considering the HRT is out, and that Macca already went for the higher chassis+stepped nose, only Marussia is left choosing to continue with the old 2013 lowered chassis -and no modesty plate - or just follow the trend. And I still don't understand how can Sauber can put a modesty pate which forms, together with the chassis, a hole in the nose, and not be considered an aero advantage. Can somebody explain in plain terms that? for Lotus for retaining the actual stepped-nose look. Looks much better than McLaren and Ferrari. :thumbup: for Lotus for retaining the actual stepped-nose look. Looks much better than McLaren and Ferrari. McLaren has said that they abandoned last year's design because they were afraid of reaching a development ceiling. But Marussia are way off the pace and are probably not going to reach that ceiling anytime soon. For them its probably easier just to continue from last year with a similar design route so they can actually get some work done on the 2014 car. Is that really the sort of debate adults have? That style of argument is probably best kept for a question like "does this dissolve in water?" Anyway, this is a great way of seeing the difference between maximum chassis height and not. Everyone in this thread other than you, it would seem. While we're on the topic I dislike the current look of f1 cars in general step or otherwise, I find the 2007 cars magnificent to behold! That's an interesting point of view. So basically they had perfected the car so much, they needed to make more fundamental changes to it. I think the stepped nose Lotus looks not too bad actually. Looks better than Ferrari or Red Bull last year. The Modesty Panel has been worked into the nose by the teams so there's no way of visually seeing any seams on them. The McLaren shows it's fully integrated with the nose as does the Ferrari. Sauber's approach is quite eye pleasing as it looks every bit the part of an F1 car though the step is still there and by the looks may add some good downforce to the front. Of the Step Noses, I don't think anyone did a better job of making it look nice outside of Sauber. Their design and engineering teams have really been on the ball since mid 2011 and their solutions to many systems have all been superb. The Coanda style exhaust was so good most of the teams copied them. Their Platypus nose was well sculpted and the way it tapered outward towards the very front was very aggressive looking. The stance of the car and the minimalism throughout the entire rear section was easily the most impressive thing since the tiny Williams gearbox with the ultra-low driveshaft placement. This years Sauber is for me the most beautiful of all the cars but the Ferrari and McLaren are beautiful cars as well. Force india is pretty ugly and looks like a lazy approach up front if you ask me. The Mercedes is much nicer than last years car but I think more than anything its livery kills the look of the car. This isn't 1948 where the cars were a single color throughout and the cars can be made to look much nicer with the proper design work on the livery. It does look pretty fast and VERY Shark-like. The Torro Rosso has the laziest of the Modesty panel designs. It's a Bolt-On component that's secured via 13 screws. Maybe that's so they can remove it if they find step noses have an aero advantage? Save designing a new nose. Doubt that's it. Airflow is at it's most efficient when traveling over and around long sweeping and smooth surfaces. The greater the amount of elements and obstacles the air encounters, the more turbulent. Strange approach by RBR though. A very small modesty plate, which still leaves a big (and rather ugly) step. So, if the modesty plate is not installed for the purpose which FIA allowed it - which was, as we know, eliminating the step -then what other reason might that be? err...aerodynamic advantage? Or am I just blabbing my mouth and the RB9 does not have a modesty panel at all? It's a not about the weight, it's about the seam all the way around it as well as the little recesses for the screws themselves though I'd imagine the air would glide right over the holes and never make its way in. It's just pretty visible for F1 IMHO. The STR one looks like someone went "Feck they've all went with panels we better knock one up before Monday"
I don't see the big deal it's a racing car that you have to drive to get to the line first before the other guy. Both RB and Sauber chose to cover the step partially but took the opposite path. Q. The RB9 keeps the stepped nose of last year. Was there any thought given to fitting the optional ‘vanity panel’? A. Newey: There is a vanity panel but it’s quite small. It doesn’t extend a huge way forward because that would add unjustifiable weight. Last year we had a letterbox design to reduce the step, which aided cooling. This year the small vanity panel has allowed us to get rid of that. Precisely my point. So, they use the allowed rule, but they don't exactly use it like it's supposed to...isn't that liable of creating suspicion? "Perfected" is perhaps not the right word. Optimized. Every design route obviously doesn't have the same potential. Some routes yield fast advancements for a while but stagnate pretty quickly. McLaren probably had such a design. In contrast Ferrari's front pull rod design took some time to get going but now it seems that it has more overall potential, or at least that's what McLaren thinks since they are using it now. 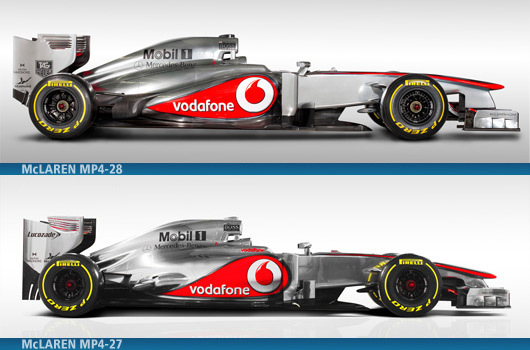 Its a fact though that McLaren had been using that low chassis for a long time so they must have known its limits.